Well, it's official. Connecticut had its first snowfall. I'm not ready yet, but I guess I have no choice, so might as well roll with it. I don't know about you, but cold weather always makes me crave comfort foods that come in a bowl like soup, stew, chili, and curry. We just love having a hearty bowl of something for dinner as we sit by a roaring fire. 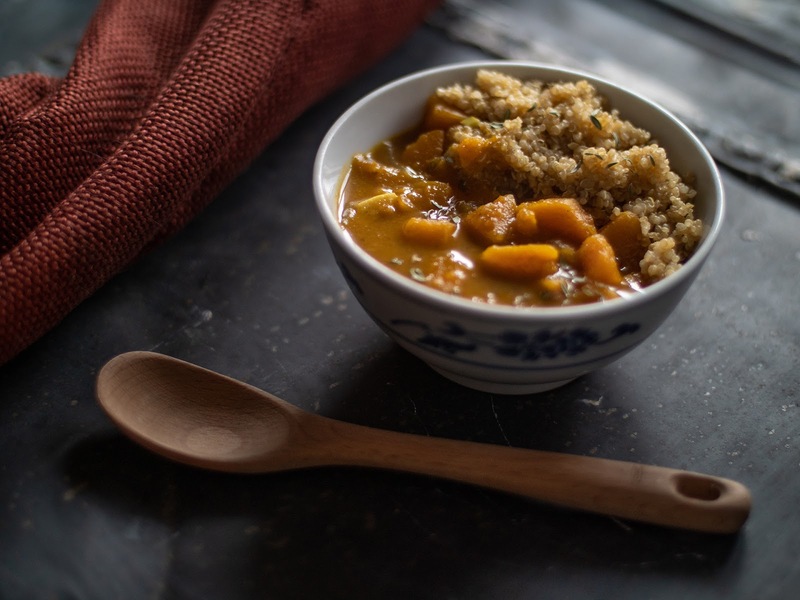 This recipe marries a butternut squash into a creamy, vegan coconut curry perfect for fireside dinners on a cold winter weather evening. 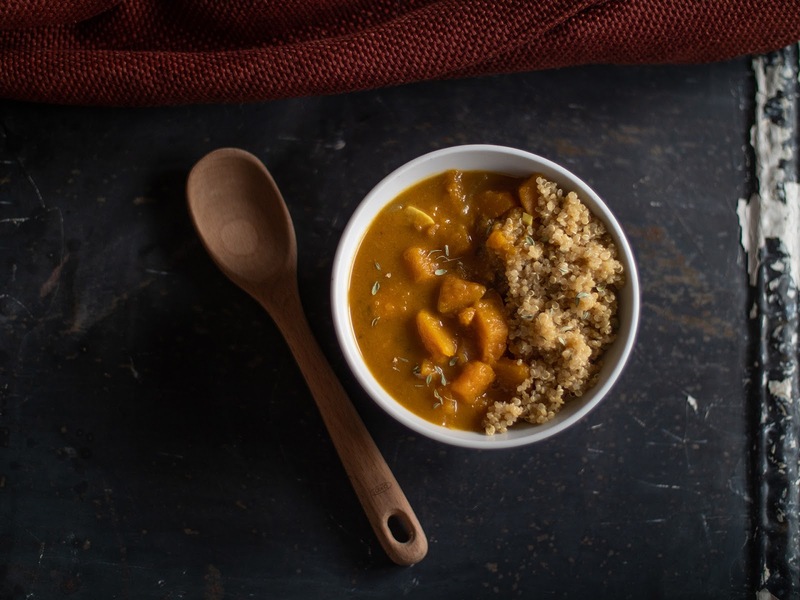 With the coconut milk as the base, I went straight for the perfect small butternut squash sitting on my counter. I love pretty much all the winter squashes but there is something so delicious about butternut squash. 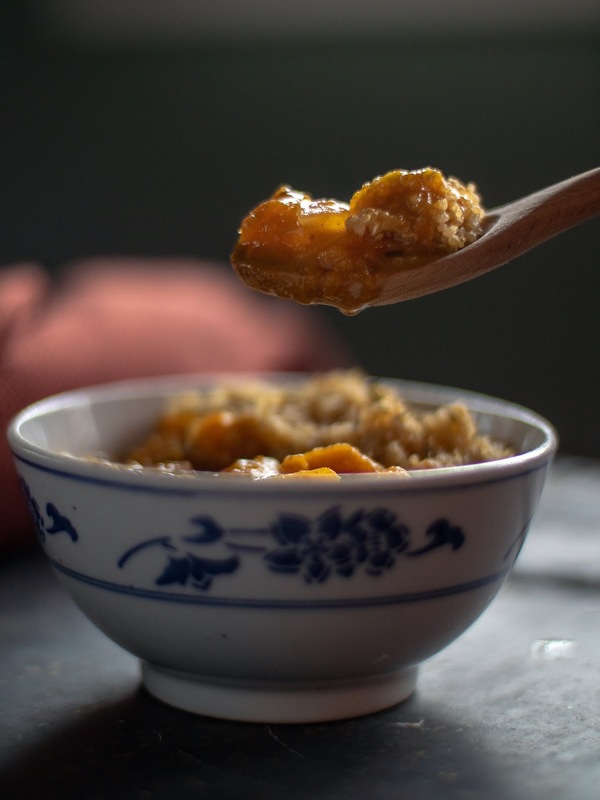 Maybe it's the dense yet tender texture and sweet, nutty flavor that seem to lend itself perfectly to stewed and saucy comfort food dishes. Once I got started cooking I realized I did not have any fresh cilantro to use in this recipe. Oy, it never fails I always forget something. However, I do have a ton of homegrown and dried herbs. So, I decided on dried thyme, which I often pair with butternut squash when I roast it. Come to find out dried thyme is often used in Jamaican curry dishes. 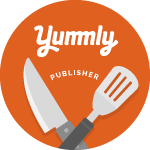 I'm happy to know my taste buds were in line with culinary traditions out there. Instead of rice, I served this creamy curry over quinoa. Bonus, it gave the dish a nice plant-based protein boost. We snuggled into our seats on the floor by the fireplace and feasted on heaping bowls of this flavorful vegan curry. It was comforting inside and out. Heat the coconut oil over medium heat. Saute the onion, garlic, and ginger until the onion is translucent. Stir in the curry powder, paprika, cayenne, and thyme. Saute for about 1 minute. Stir in the squash, coconut milk, and vegetable broth. Bring to a boil. Cover and reduce heat to low. Let simmer for 20-30 minutes until squash is fork tender. Serve over cooked quinoa or rice.